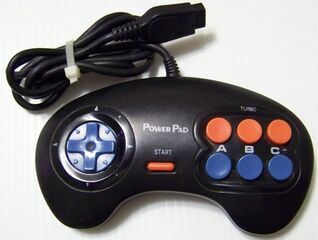 The Power Pad is a third-party controlled for the Sega Mega Drive, thought to have been created by Honest Soft in Taiwan. It is a three button controller with turbo features. This controller's history is not fully understood - it was sold in the US by Champ and in the UK by Teqniche, but multiple unexplained variants also exist, such as common variant by Recoton also sold in the US. The "Power Pad" range would continue with the Power Pad 6, Power Pad Plus and PowerPad 100. Main article: Power Pad/Magazine articles.